My birthday dinner was pretty special. 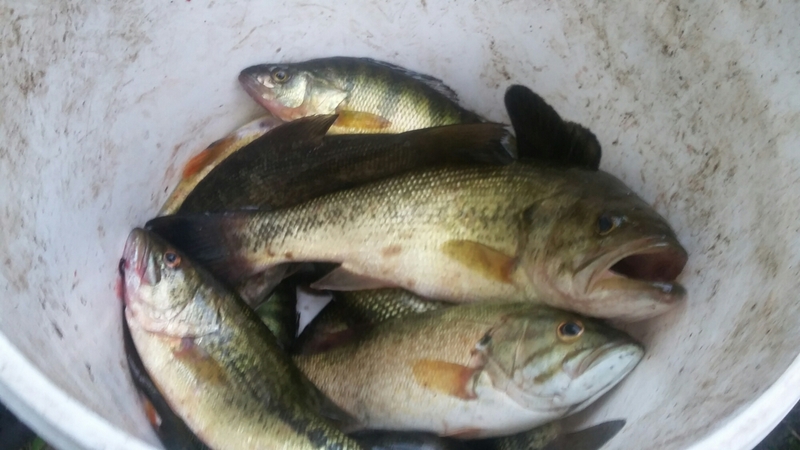 I had the opportunity to try my new fishing rod (happy birthday to me) the other day and first time out it caught a bunch of perch and some nice sized bass. Perch tacos sounded like the right thing. 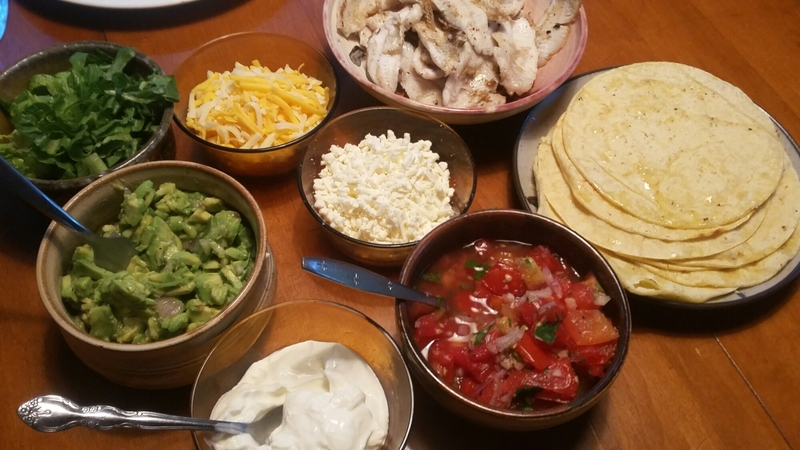 I pan fried the fish in clarified butter, heated up a stack of corn tortillas and put out a bunch of simple toppings. They were so good. 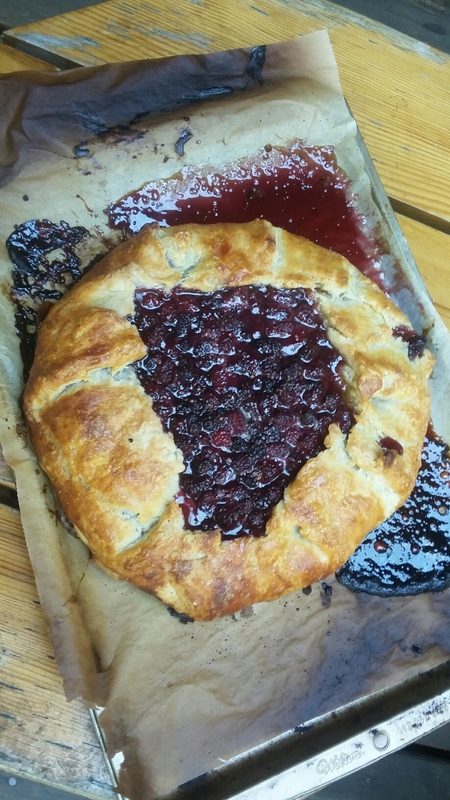 For dessert I made a wild blackberry galette. Jerry and Ann had shown up at the market with mounds of fresh picked berries and I bought a 3 quart basket. 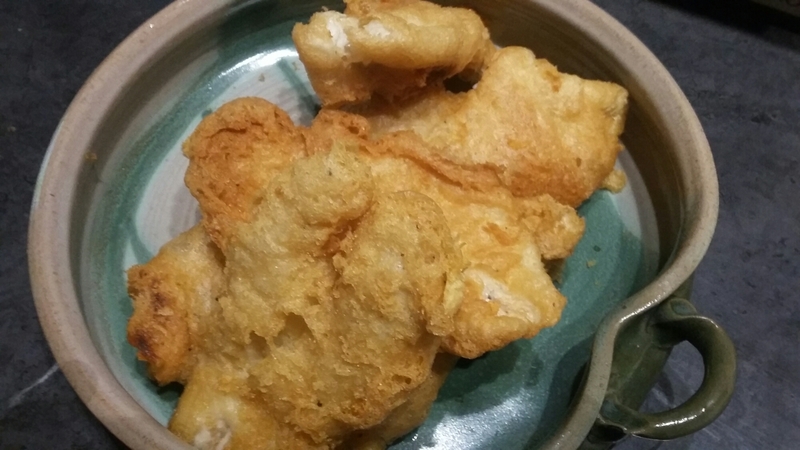 The bass became beer battered fish and chips for Saturday lunch. It was a really simple batter with beer (ipa) baking soda, flour, and honey and it turned out really crispy. 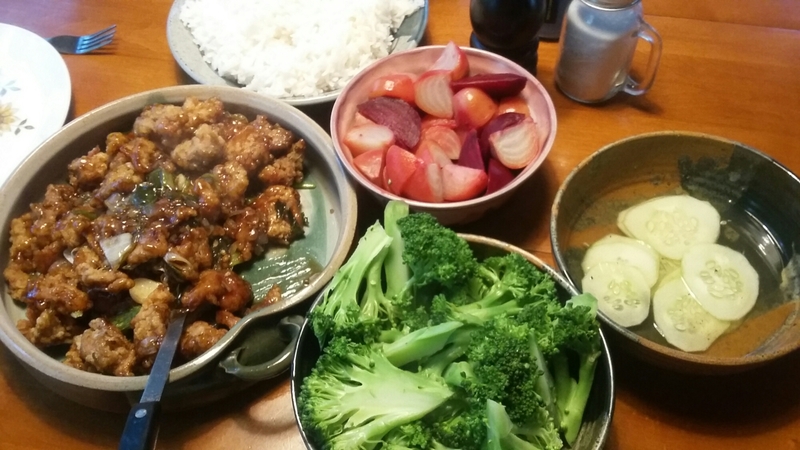 Saturday dinner was another totally local feast with pork chops and a pile of veg from my garden and the market. I made a blackberry pie. 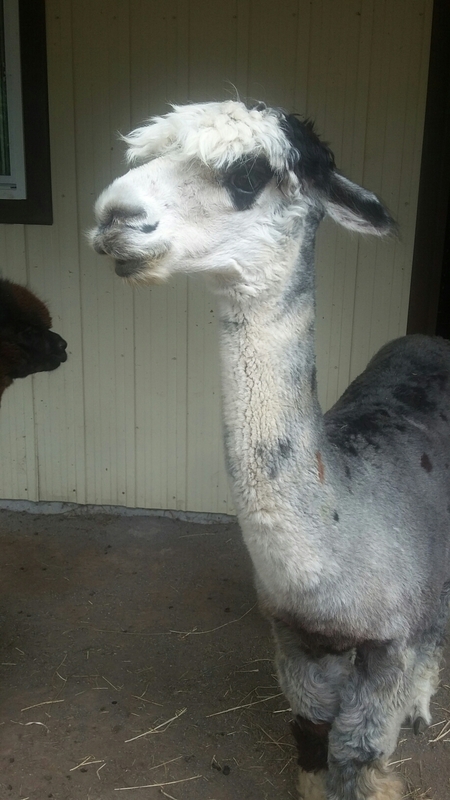 Sunday morning I picked up a few friends and we went to an Alpaca farm and store near Renfrew. 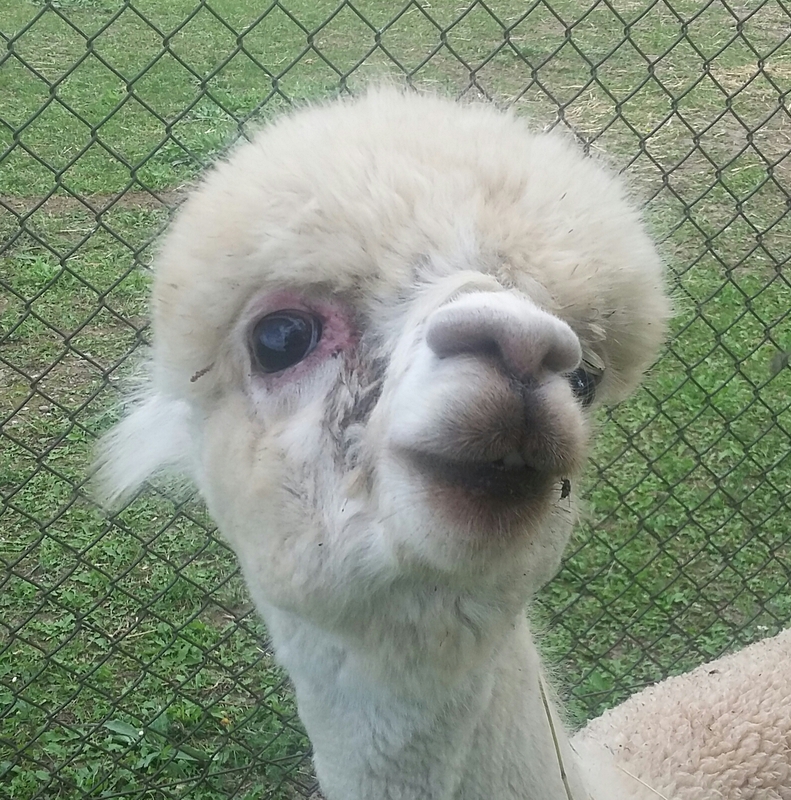 The gracious host spent nearly 2 hours with us talking passionately about her animals and their fleece. Such a cool experience. 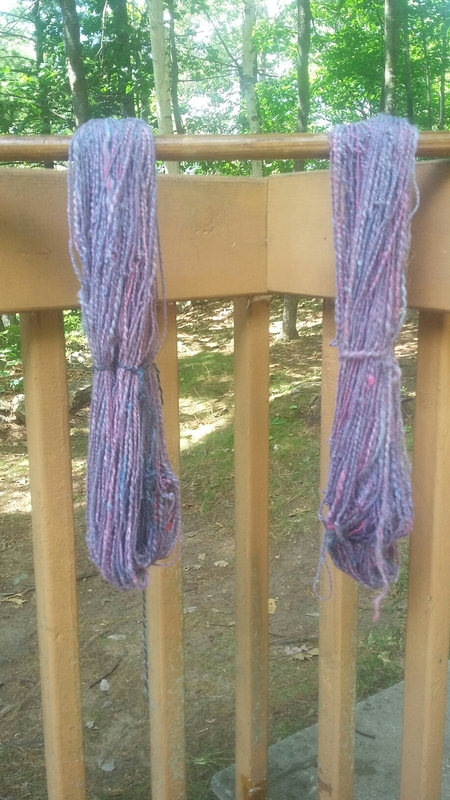 I came away with one bag of roving and a skein of mid-weight yarn and a connection to a local Lanark County mill that I could potentially send fleeces to get roving made. Jerry and Ann live and farm out on Centreview Road and sell their produce at the Barry’s Bay market. In season they pick loads of wild berries. 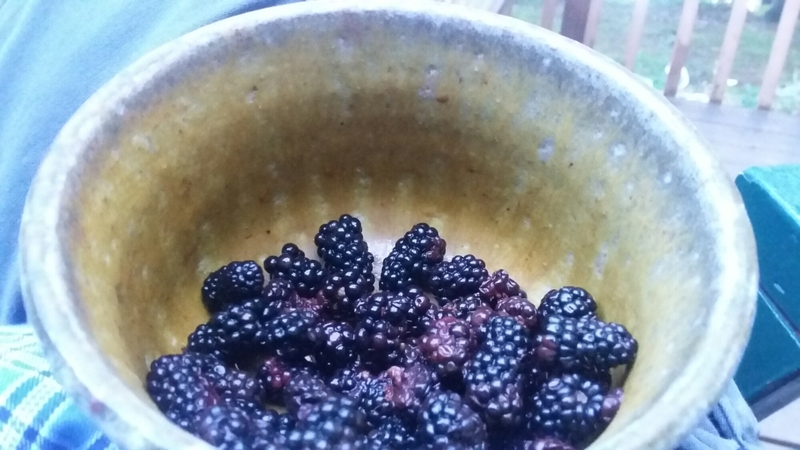 This week it was blackberries and I feasted! I bought 3 quarts, ate one right away and turned the rest into jam. 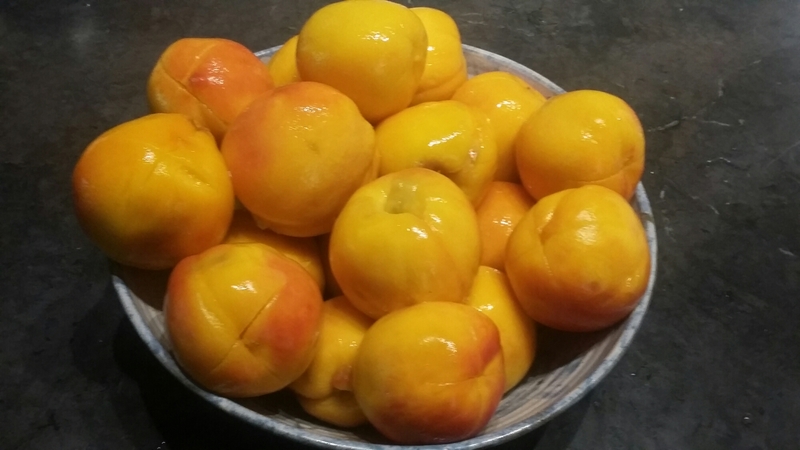 It’s also peach season. 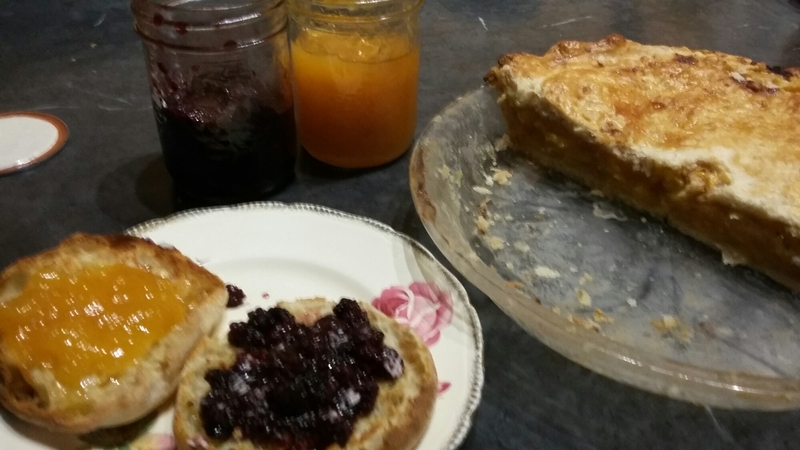 I picked up a couple of baskets, ate some, baked a pie (mmmmmm), and made a batch of jam. 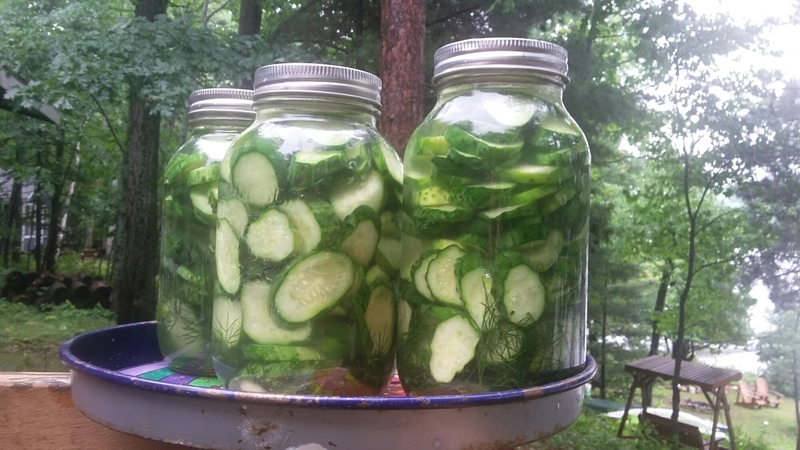 Joanne grows the best little pickling cucumbers and I picked up another basket of them at the Combermere market. They became another batch of lacto-fermented honey garlic dills. 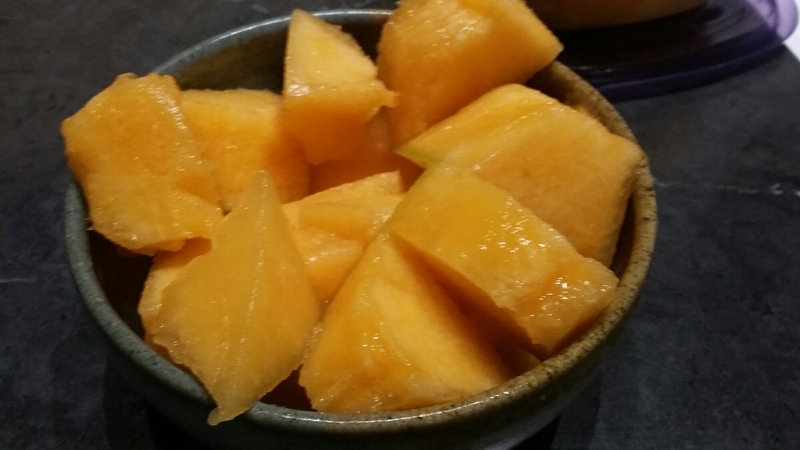 And this cantaloupe is likely the sweetest and juiciest I’ve ever tasted. Linda has an acre devoted to squash and these cantaloupes were volunteers (i.e. just ‘weeds’ that grew among the squash she planted.) So good. So the count for the weekend: 4 jars of blackberry jam, 7 jars of peach jam, 4 litres of honey garlic dills, and a peach pie. And we had a feast of a dinner with garlic-pepper sausages from Helenka, real baby carrots from Joanne, flat yellow ‘romano’ beans from Chris, and corn from David. I love this time of year and I love being on a first name basis with all of my farmers. 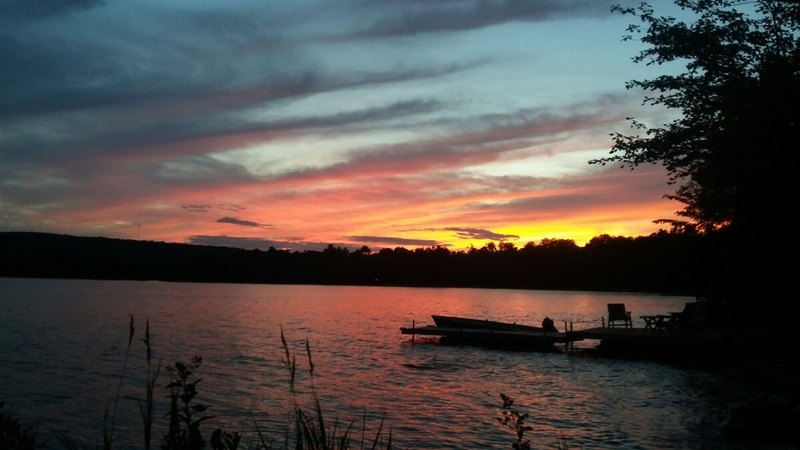 Another great weekend at the cottage. For my vacation I decided to take on a dye-blend-spin-knit project. Originally I had hoped to make socks but the finished yarn was a little heavy for socks so I made a scarf instead. I started by weighing the fibres. 75% wool (bluefaced leicester) 20% nylon and 5% silk. 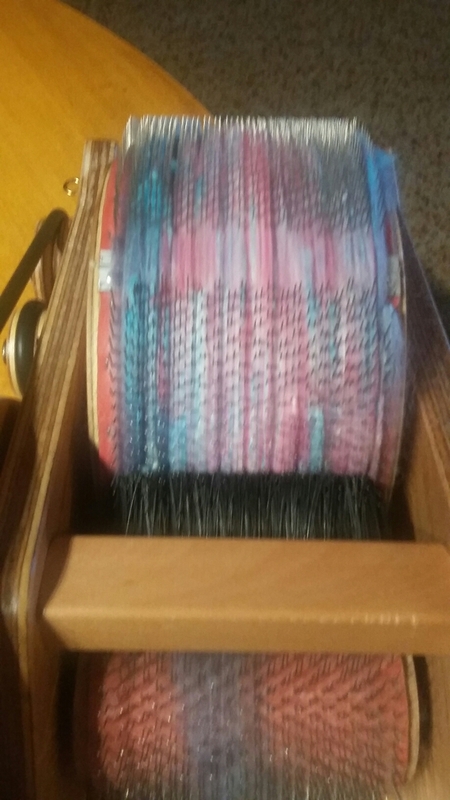 I chose to dye each fibre a different colour. 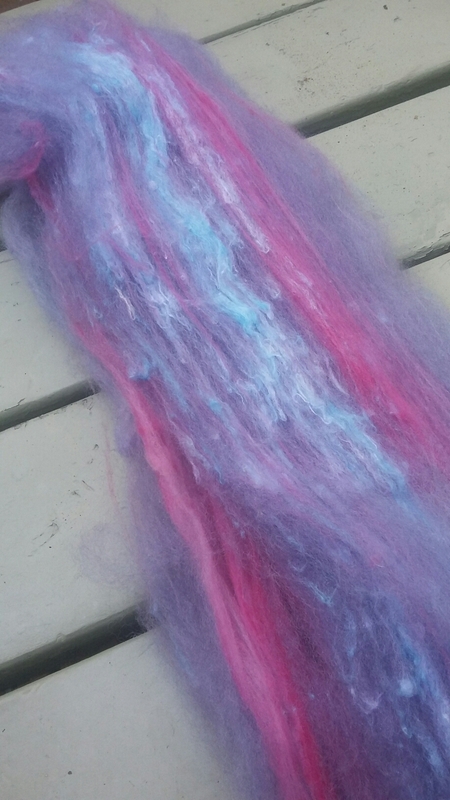 The silk is straight-up cyan, the nylon magenta and the wool I dyed purple by mixing cyan and magenta in the dye pot. 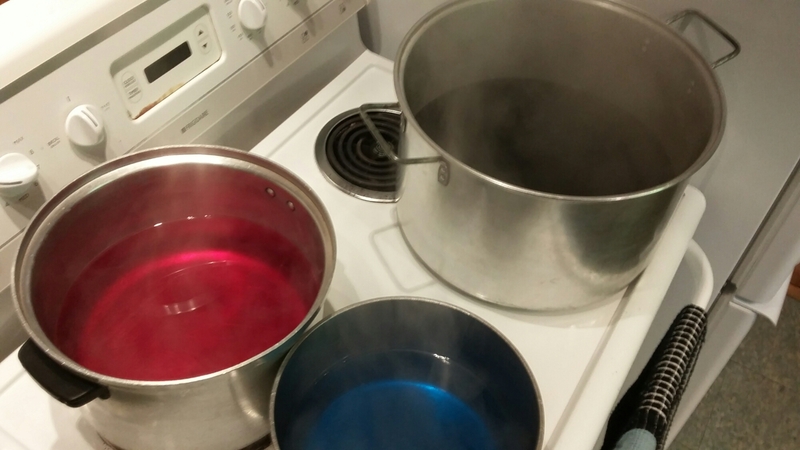 I used food colour as dye and vinegar helped the fibre absorb it. 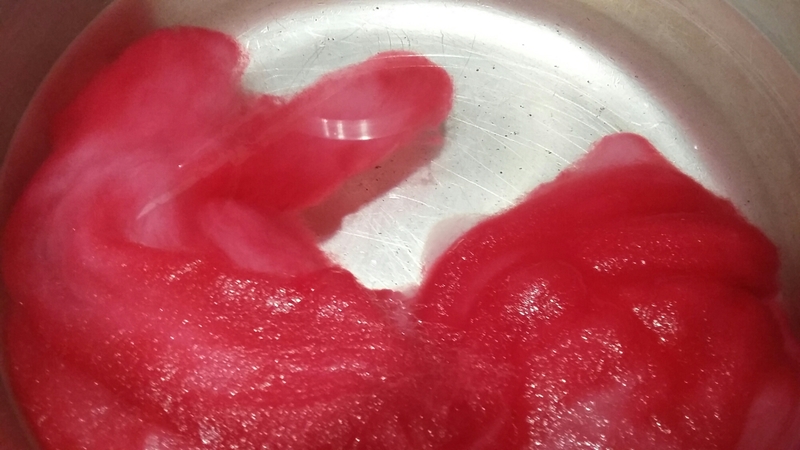 After 20 minutes or so the fibre absorbed all the dye and the water was clear. 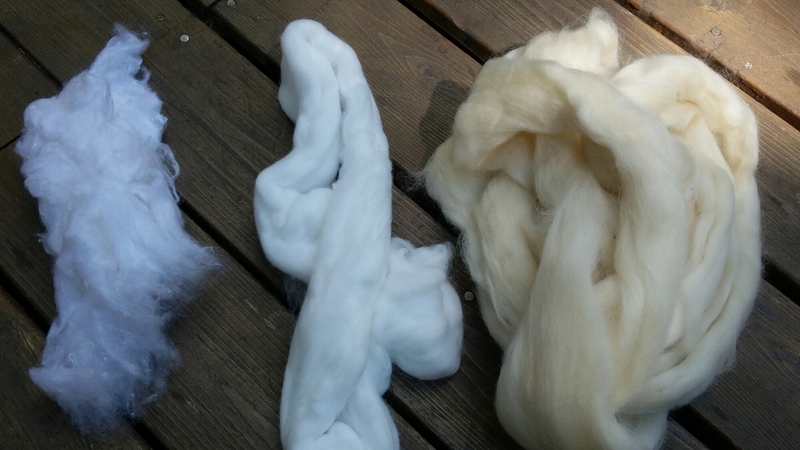 I used a drum carder to blend the fibres and make a batt that I could spin. I spun it all and then made a 2-ply yarn by twisting 2 strands together in the opposite direction from the way they were spun. 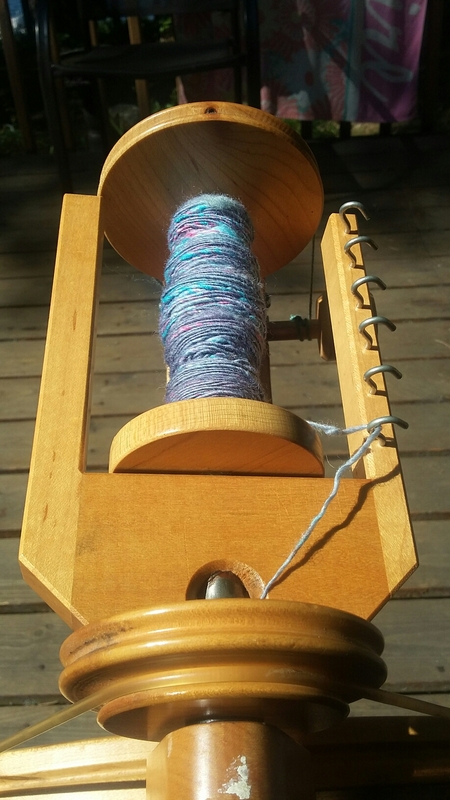 The consistency of my spinning continues to improve. I have a long way to go yet but I can spin well enough that I want to knit the results. 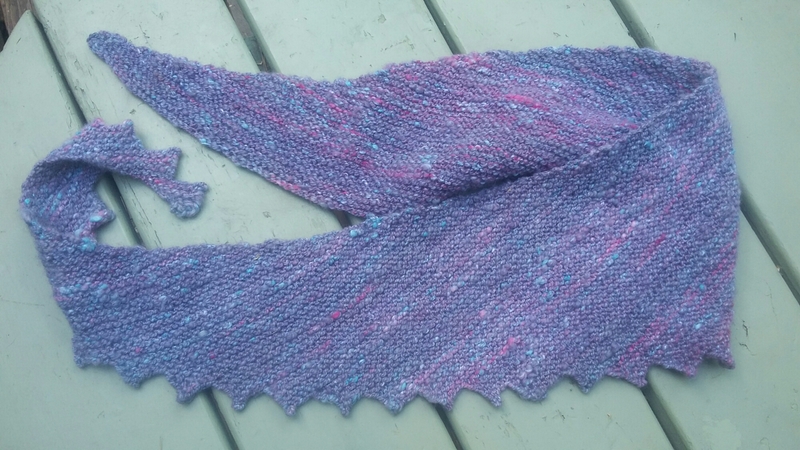 The garter stitch design gives it good texture and shows off the verigated yarn and the silk and nylon make it incredibly soft. My next project will be to start working my way through some of the fibre I have in my stash. I picked up lots of bits and pieces during my course and every time I see Lois she generously donates more to the pile. I don’t think I have enough of any one thing to knit a project but it will be good practise and I can always use it all up knitting another pinwheel sampler blanket or maybe a hat and mitts. The more miles I put on the wheel the better my end product will be. Well that was a vacation! Today is my last day of what has been a great vacation at the cottage. Lots of family and friends and relaxation. It kicked off with an evening of fishing with my new friend Barry (K not C) and a few good feeds of fish. 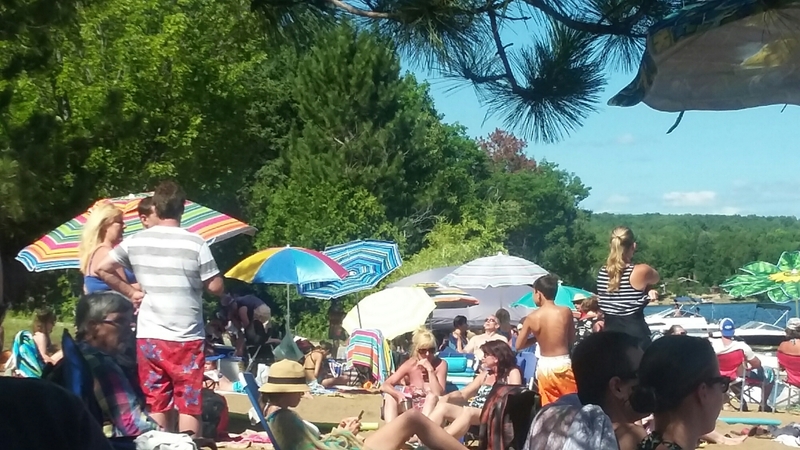 Next up was the Kamaniskeg Regatta and a family party to celebrate our 50th anniversary at the lake. On the first weekend my friend John visited from Kitchener and on the last weekend my friend Jay and his son Max visited from Ottawa. Max is a born athlete and at 9 years old was able to get up skiing on his first try without help. He skied 4 more times after that until his arms were jelly and was crossing the wake back and forth with ease. On the weekend in the middle my cousin came up with his family and that was lots of fun! 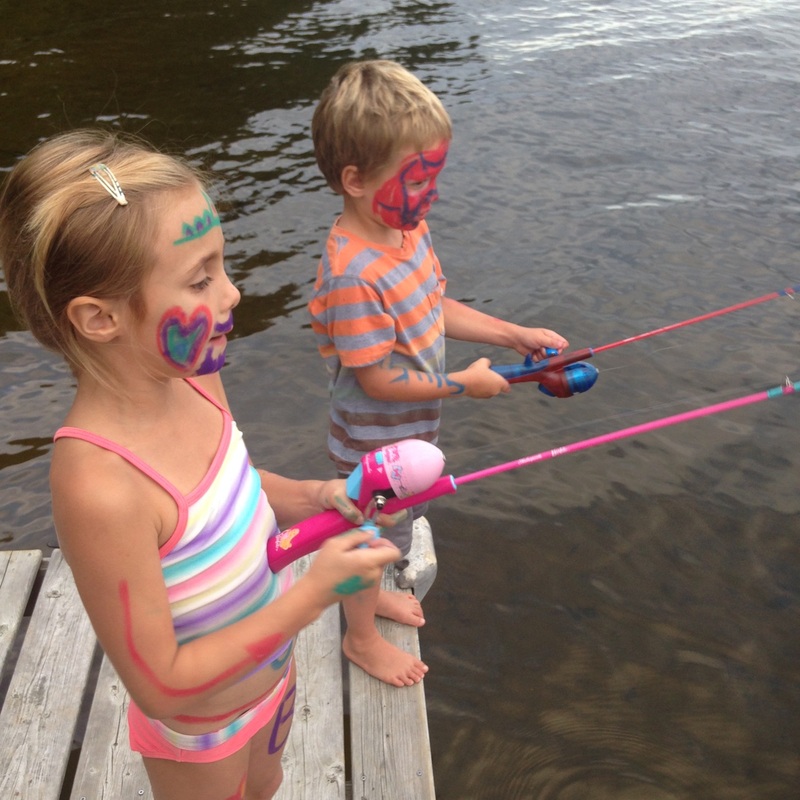 Fishing, tubing, skiing and swimming for 5 days straight! We were all exhausted by the end. 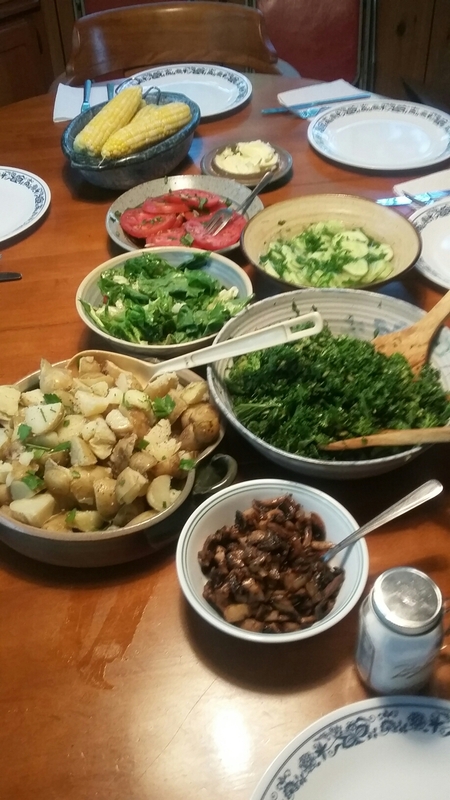 We had lots of feasts of mostly local food and it was great. 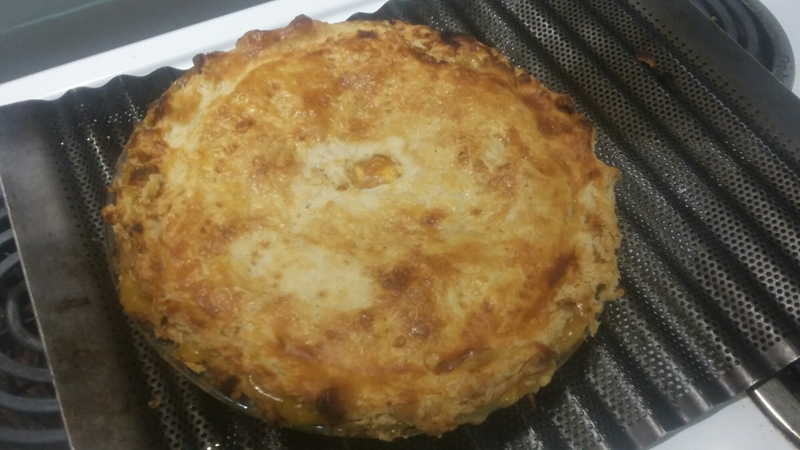 I took the opportunity to try some new recipes and cooking methods that will likely end up here in a future post. I think the best new dish was kkanpunggi – Korean style spicy garlic fried chicken. Ìt was out of this world. 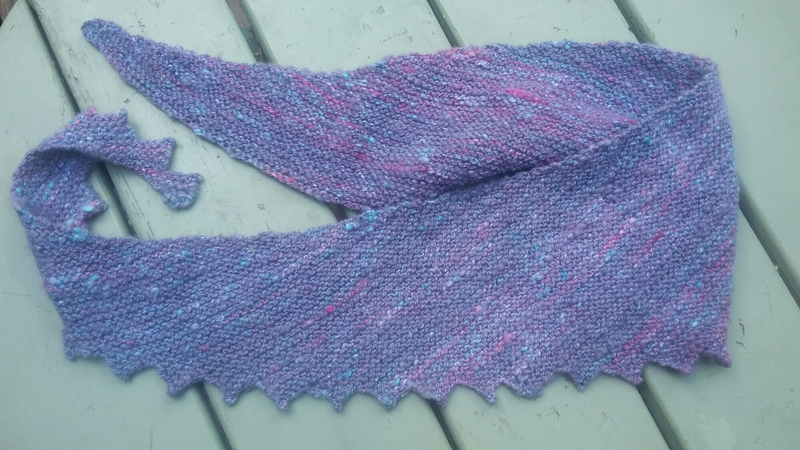 I did a fibre project. Dye, blend, spin, knit. I’m not quite finished yet but I guarantee it won’t take me year. I’ll post it when im finished along with a post about other spinning projects. 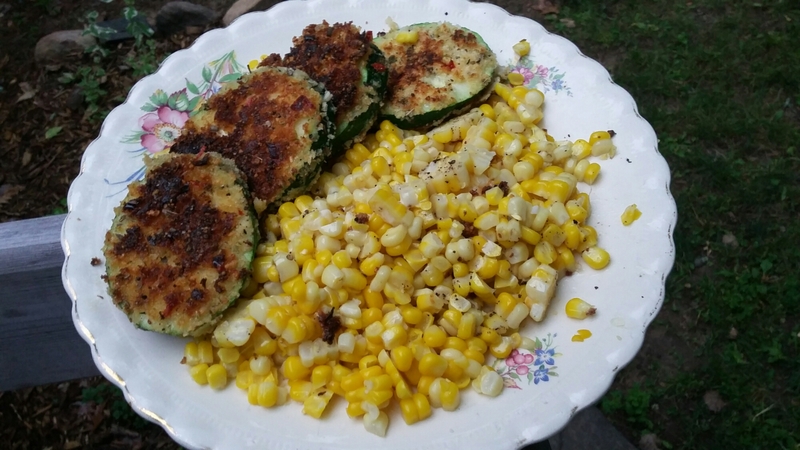 I’m still eating broccoli from my garden every day and now I’ve added zucchini to the daily routine. And of course I made some pickles and some relish. 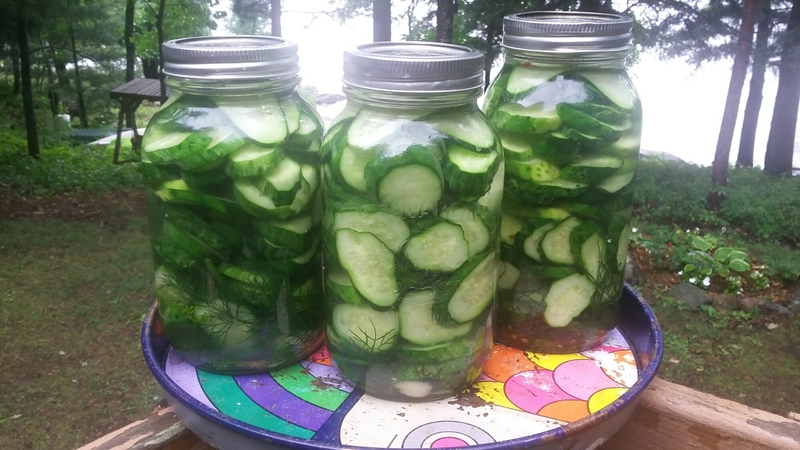 Canning season begins in earnest now so lots more to come for sure. Back to work for me tomorrow. It feels like I’ve had a real vacation. I haven’t checked my work email or checked in for 2 weeks now and that feels great. 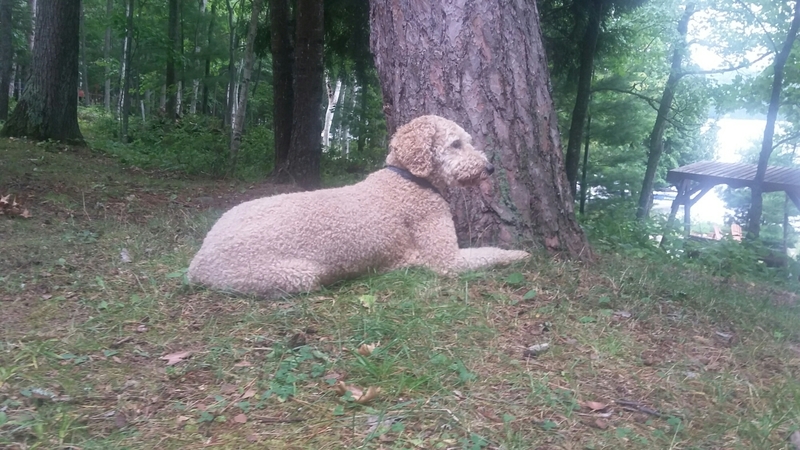 Molly will stay at the cottage hugging the trees and guarding the squirrels while I try to ease myself back into work life. 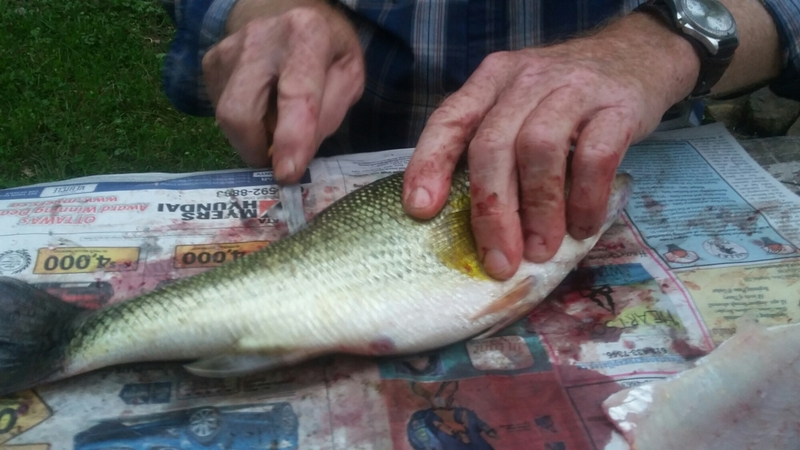 The father of a woman I work with is an avid fisherman. 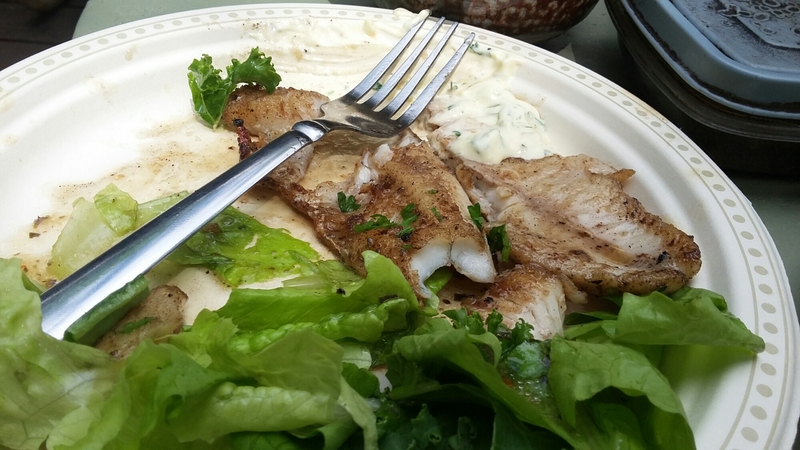 He invited me out to his cottage near Rockingham and we went fishing. The set up was simple and we were out on the lake in no time. It’s a small lake about 2 km long with less than a dozen cottages and so many fish they almost jump in the boat. 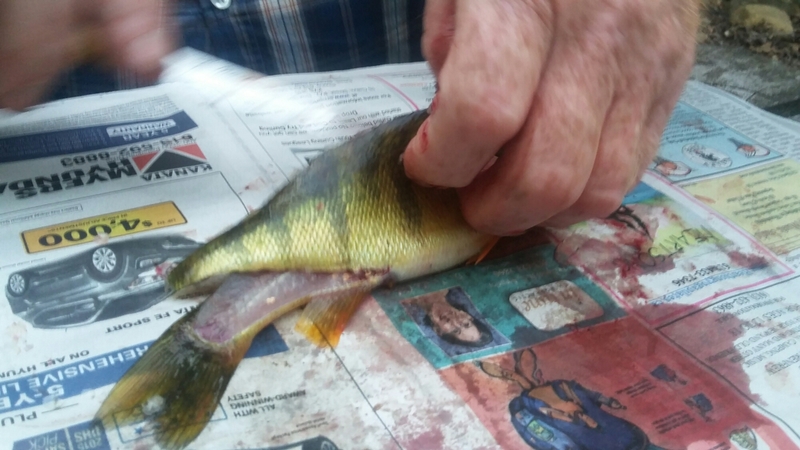 The fish started biting on the first cast and in no time we’d caught a bucket of perch and bass. We threw back the bigger fish and kept the small ones. Barry said they taste better. Barry made quick work of taking the filets off and skinning them. 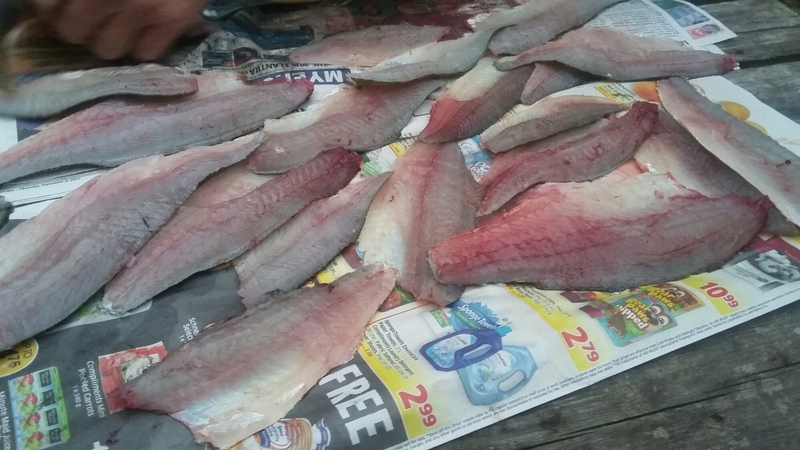 It was amazing to watch him work so quickly and efficiently and he talked the whole time, teaching and telling stories of what lakes in the area are best for which fish. I take it that he’s something of a fish-whisperer and knows exactly how to coax the fish on to his hook. 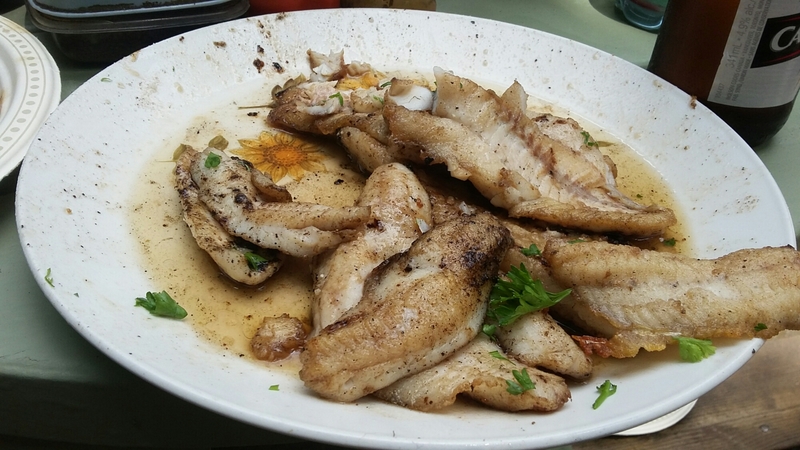 There was much discussion about the best way to cook the fish. The collective wisdom favours a coating of no name soda crackers (they taste different than name brand, don’t you know) and lemon pepper and then fried in a mix of butter and grapeseed oil. 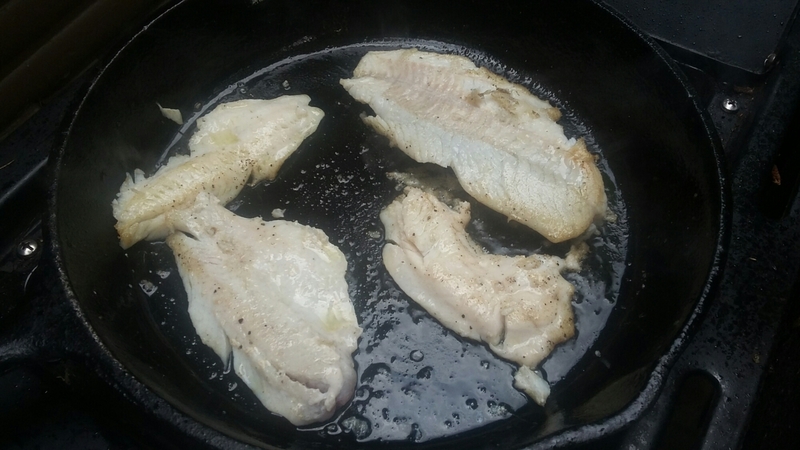 I opted to soak all the filets in a week brine of salt water overnight to get the blood out then a quick pan fry in clarified butter with salt and pepper. It was amazing. We had enough for a big lunch and more to cook for breakfast the next day. I haven’t eaten much fish since I moved up here because the stuff available in the grocery stores really doesn’t excite me. I sense that might change now. Barry seems like he’s up for a new fishing buddy and I’m up for a new hobby. I fished a lot when I was a kid and I always figured I’d get back to it when I was old 🙂 No time like the present.